While at PAX this weekend I was asked by a number of people about running D&D with kids. 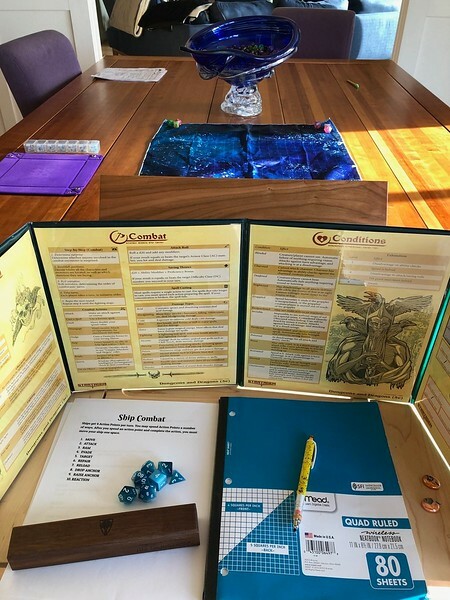 I’ve recently switched up my home D&D game and I thought I’d share some of my key learnings. The first game I ran for my family was taken straight from Dragonlance. I used the first book Dragons of Autumn as a guide and it went pretty well. Kara and Gabe (who is 14) both loved it but Noah (who is 8) had a hard time getting into it. He tried his best and we managed to get through the first book but after it was over he said he didn’t want to play anymore. I thought about the adventure and as I looked back on it I had a couple thoughts as to why it did not click with Noah. -Noah is eight and playing an adult Fighter. Trying to put himself in the headspace of a grown man and role play as such was incredibly hard for him. -The story and the world did not interest him. Kara and Gabe both really wanted to play more and I was not ready to give up on a family D&D game just yet. One of our favorite things to do together is play Sea of Thieves and so I started thinking about a SoT themed D&D adventure. I figured Noah was super familiar with the setting and already loved it. The next thing I did was ask him if he’d be interested in playing a kid instead of an adult. His face lit up and he asked if he could be a nine year old boy in the game. I told him of course and I went to work on the adventure. In the first game Noah’s character was a young boy living with his father. He never knew his Mom and his Dad didn’t speak about her. The game begins when pirates attack their village and Noah is forced to flee with only a hat that his father places on his head before telling him to run. Noah met up with Kara and Gabe who had their own reasons for wanting to leave the island that night. The party discoverers a map hidden in the stitching of Noah’s hat and decide to follow it. The first destination reveals a treasure chest and Noah learns that the mother he never knew is actually Eva Norton the famous Pirate Queen! That’s where we ended the first game and Noah was 100% hooked. We’ve played twice since that first game and the story continues to hold his attention. I really feel like setting it in a world that he was already familiar with and could easily imagine helped a lot. He knows what the boats looks like and the skeletons. He can close his eyes and picture a kraken attacking their ship. Letting him play as a kid was the other big part of this I think. He can put himself in his characters shoes much easier and I’ve noticed him role playing a lot more at the table. Drawing the characters and monsters that he meets during the game is another way I’ve found to keep him engaged at the table. I can’t recommend role playing with your family enough. I know Tycho has a couple games he plays with his kids as well. We are telling stories here that our family will have for years to come. In the most recent game the party was asked by a pirate captain to come aboard his ship and help weed out a possible mutiny. Their plan was to make their way around the ship subtly asking about morale. Noah walks up to the ship’s cook and just says “So…how would you feel if the captain died?” and we all just lost it. I’ll still remember that when he’s getting married.